Hi Aspirants, here is the Important Current Affairs Updates for 14 September 2016. 1. World’s longest bullet train network was recently established in which country? 2. Super Typhoon Meranti recently hit which country? 3. 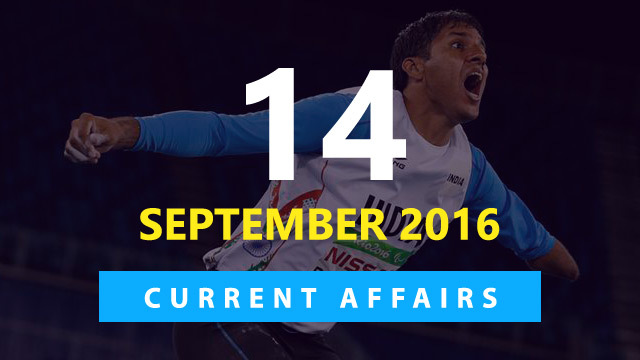 Name the para-athlete who will be India’s flag bearer in the closing ceremony of the Rio Paralympics 2016? 4. Name the Indian para-athlete who recently became the first Indian to win two gold medals at the Paralympics? 5. Which committee has recently submitted its report to prepare a road map for elimination of poverty? 6. The third edition of BRICS Urbanisation Forum Meet was recently held in which Indian city? 7. Union Government has recently launched a toll free number___ to register postal complaints? 8. The National Hindi Divas is annually celebrated on? 9. Track Asia Cup Cycling event recently commenced in which of the following cities? 10. Who recently become the first Indian woman to win a medal in the Paralympics?